The competitive world does not let anyone compromise on their vocational responsibilities. At the same time, there are other urgent matters such as spending time with family and friends which are equally important. There is also the social life to attend to. Amidst these activities that take up most, if not all, of your daily hours, it is generally difficult to stick to a workout schedule. As long as job responsibilities keep rising, you will find less and less time to devote to your exercise regimen. But to have an active healthy lifestyle, it is extremely important to workout properly and to keep a proper balance between your personal and professional lives. It is easier said than done but there are ways to maintain your daily workout routine even when you’re busy. To achieve this, you will have to practice and stick to certain habits. One of the first things to do is to choose your workouts very wisely. This is especially true if you have a gruelling daily schedule. The exercises should be those that can be carried out anywhere you go. They may include jogging, running, aerobics, etc. You have to make sure that these choices do not need much preparation and can be carried out quite easily. Make a schedule and stick to it, if possible. For instance, instead of fixing a daily time for jogging, you can fix one hour in the evening as your jogging time. This way, even if your timings vary due to your work schedule you will still get your exercise. It is not possible for everyone to prefer similar kinds of workouts. If someone likes jogging, it is not necessary that you should like it also. It is possible that you may prefer yoga over other workouts. Or you may prefer swimming. Always pick the exercises you like, else you will be stressed out after a few days. Choose workouts according to your level of tolerance to stress, and your comfort level. It is not possible to find that out in a single day. Therefore, before sticking to a particular choice, try your hands on various exercises, find the ones you like and which help you. This way, you will enjoy your workouts and would want to do them daily. It is a time-tested truth that goals bring out the best in a person. This theory also holds true for effective workouts. Before working out, set a target for yourself, and try to achieve that goal. Gradually increase the target, and try to better that the next time. A goal-led exercise regimen will help you stick to an exercise schedule. Most offices have gyms that you can use. You can try hitting the machines early in the morning or stay back for an hour after work. This way you miss the traffic rush and also get some exercises. Another thing to do is to try using the office time to burn some calories. Use the stairs, stretch for a minute or two – all activities that can be done while you are at work. There are plenty of such examples on maintaining daily workout routines, even if schedules are tight. The only thing that matters in this case is your intention. If you are determined enough to pursue the workouts, then no busy schedule can stop you from doing that. Just make a decision and go for it. 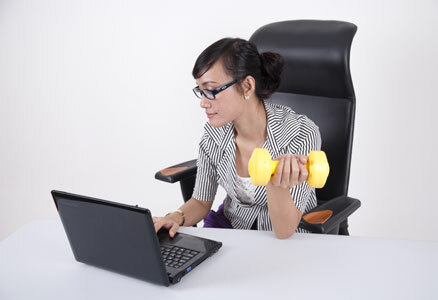 Complement your workout at office with a glass of healthy juice in the morning! Find out more about our sugar free juices collection now!